Long before Mork and Mindy, ALF or Third Rock from the Sun, one TV show helped to pioneer the idea of an alien sitcom: My Favorite Martian is a surprisingly odd show. It stars Ray Walston and Bill Bixby, two phenomenal actors. And it’s now available as a single DVD box set. My Favorite Martian is the story of a Martian (played by Walston, whom Star Trek fans will remember as Boothby) who comes to Earth. And he makes friends with a newspaper reporter named Tim (played by Bixby, who later starred in The Incredible Hulk). Tim decides to pass the alien off as his uncle Martin, and the two men live together. This show only ran for three seasons, but because television was insane back in the 1960s, there are 107 episodes. The typical episode revolves around one of a few things: Tim is trying to carry on with his normal life of being a reporter and trying to date skinny blonde women, but Uncle Martin screws everything up with his Martian hijinks. Or Tim accidentally screws around with one of Uncle Martin’s gizmos and gets into hot water. Or else, Uncle Martin helps Tim to solve some problem. Basically, My Favorite Martian is Bewitched, if Samantha was an older man and Darren was pretending to be Samantha’s nephew. There’s not a lot of the “trying to understand a different culture” stuff that later shows like Mork or 3rd Rock paid lip-service to. In fact, watching the Martian pilot, it’s amazing how quickly the show rushes through the set-up. Tim believes Martin is a Martian almost immediately, and then they’re caught up in some wacky hijinks. What makes this show so interesting is the way that Ray Walston plays the title character. He’s doing a version of your typical 1950s and 1960s “quirky” alien, the sort of character that you see in movies and television from before Leonard Nimoy changed everything. But Walston puts too much mischievous weirdness into the character of Uncle Martin to be just a regular alien. He’s clearly taking a lot of pleasure in being a disruptive influence in Tim’s life, but he’s also a bit of a pedant and a cranky authority figure. Walston does this thing with his eyes, with one wider than the other, that makes him look a bit demented and constantly a little flirtatious. In fact, it’s hard not to compare Walston’s Martian portrayal with William Hartnell’s run on Doctor Who, which was happening across the Atlantic at the same time. They both have a fussy “cranky professor” thing going on, but Walston is a bit more dry and ironic in his oddness. Bill Bixby, meanwhile, is almost unrecognizeable to fans of The Incredible Hulk. He’s much younger here, but he’s also doing a much goofier character. Bixby is always mugging and doing an exaggerated “aw shucks” put-upon voice as he deals with the latest gosh-darn thing that having an alien under his roof has caused to happen to him. I gotta say, Walston’s performance is kind of great, but Bixby is clearly aware that he’s in a ridiculous sitcom and is acting accordingly. I haven’t watched all 107 episodes, but based on the ones I did watch, the show’s first season is clearly the best. (As is the case with so many of these shows.) In season one, Tim’s job as a newspaper reporter matters, and there are a number of storylines where Tim is trying to get a scoop or prove himself, and Martin either helps or gets in the way. And the characters of Tim’s landlady and her young daughter are also played to good effect. After the first season, a new policeman character is added, and the show is suddenly doing a lot more stories about the police detective being suspicious of Tim and his weird uncle. The best episodes are the ones where the show just goes completely nuts—like one where Martin accidentally turns a squirrel into a human, and Tim, Martin and the squirrel have to form a Beatles-inspired singing group (complete with Beatle wigs) to get out of a sticky situation. They become a huge sensation, but the squirrel has to return to squirrel form, leaving their screaming fans disappointed. In another episode, a rabbit eats a Martian pill and becomes six feet tall. There is also random time travel, telepathy, and a few other science fiction tropes. And sitting in bed binge-watching episodes of My Favorite Martian turned out to be unexpectedly fun, because they’re just so silly and good-humored, and it has that old-school TV thing where nobody ever really learns anything and the plots are just random, and everything is fixed at the end of 20-odd minutes. 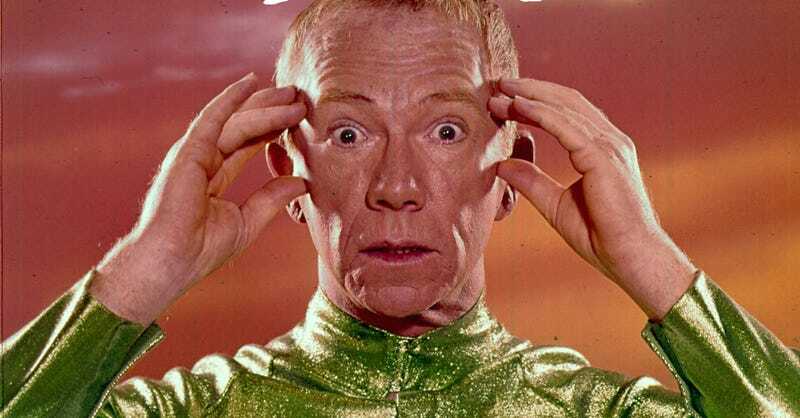 There’s something slightly subversive about the way that Ray Walston is cocking his eyebrow at everything all the time, and the way he trolls all the humans. Plus it’s hard not to look at Ray Walston and Bill Bixby, in this day and age, and not see a married couple. They have so much more chemistry than Bixby has with any of the women on the show. The DVD box set features beautifully restored picture and sound quality—at least on my computer screen, it looked great and had no noticeable blur or hiss or anything. (The episodes are almost all on Hulu, too, by the look of things.) The DVD set’s extras are a wee bit disappointing: There are some vintage radio interviews and a few bits of behind-the-scenes effects work, but no real look into the making of the show. The best extras are all of the random advertisements that incorporate the show’s credits into ads for breakfast cereals and other stuff. Anyway, My Favorite Martian would be a pretty good present for that person in your life who’s seen all the more well-known science fiction shows a dozen times. This is a major piece of science fiction history, that I suspect most younger people have never seen, and it’s pretty funny, both intentionally and unintentionally. And you can’t really beat Ray Walston and Bill Bixby as the stars of the show.